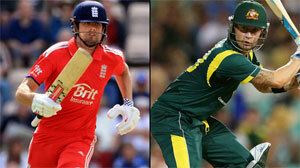 England is all set to take on Australia in the 1st ODI match today. There will be a total of 5 ODI match played between the two teams. Alastair Cook is leading team England while Michael Clarke will be leading team Australia. Both the teams are under great form, lets looks forward to a great match. The match is on 6.09.2013. Mulank of the date of the match is 3, while the Namank of Team England is 8. The relationship between 3 and 8 is neutral, which indicates neither a negative sign nor a positive sign. Further, the captain of the team is Alastair Cook, whose Namank is 7. The relationship between 3 and 7 is again neutral. The Mulank of birthday of Alastair Cook is 7, which shares a neutral bond with 3. The match is on 6.09.2013. Mulank of the date of the match is 3, while the Namank of Team Australia is 4 . The relationship between 3 and 4 is neutral, which indicates neither a positive sign nor a negative one. Further, the captain of the team is Michael Clarke, whose Namank is 3. The relationship between the 3 and 3 is friendly, which indicates a positive sign. The Mulank of birthday of Michael Clarke is 2, which shares a neutral bond with 3. Cook is not playing this series!